Climatekos and Trinomics have written a handbook to support countries in the South region of the European Neighbourhood and Partnership Instrument (ENPI) in accessing climate finance. 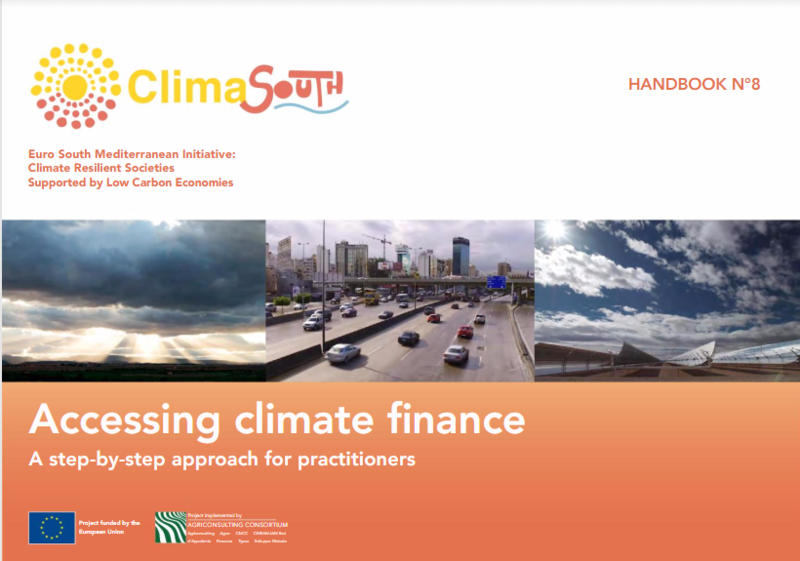 The handbook, with the title “Accessing climate finance: A step-by-step approach for practitioners”, was released in a joint EIB/ClimaSouth side event at the COP-22 in Marrakesh. The ENPI South region (Algeria, Egypt, Israel, Jordan, Lebanon, Libya, Morocco, Palestine and Tunisia) is severely water stressed, and climate change is likely to exacerbate this situation. Adaptation projects are emerging, but more finance is needed to address land degradation and desertification, which have severe implications on agricultural production. At the same time, the region presents great potential for renewable energy investments, but international funding has so far been concentrated in only a few countries, most notably Morocco. The handbook aims to give government officials and other stakeholders the tools to prepare and assess project applications to international and national climate funds, so that more climate finance can be mobilised to the region. It provides an overview of relevant funding sources, and templates for a concept note and full project/programme proposal that can be used in the application to the funds. The templates include important information sources and examples of best practices. The handbook responds to the needs that were voiced during the ClimaSouth Climate Finance regional workshop for the southern and eastern Mediterranean countries, held in Barcelona on 9–11 March 2016. Although specifically conceived for ENPI South countries, the guidelines in the handbook may be used by stakeholders globally. Decision trees give an overview of funding options, giving guidance on which funding sources and opportunities may best apply to a given project concept or proposal. A funds overview matrix shows the main multilateral and bilateral funds/programmes, development finance, and funding opportunities from the private sector and non-governmental investors. A simple scoring system has been developed to assist with the decisions as to whether the concept or proposal under consideration should be taken forward, sent back with a request for additional information or rejected outright. The material and tools comply with the increasing tendency of public financial players to privilege projects or programmes endowed with co-financing, and not to individually finance all components of proposed projects/programmes. The tools also aim at incorporating private sector perspectives, in order to potentially leverage funding for private climate initiatives through public co-finance or seed finance and public-private partnerships. The combination of traditional investments with innovative financing is increasingly gaining traction, with larger funds expecting to leverage more private investments together with public finance. Blending aims at financing projects by pooling resources and using complementary grants and loans, ensuring a high leverage effect on limited grant resources.